This curriculum is for the high school wood craftsman who is competent with a table saw, radial arm saw, drill press, and jig saw. 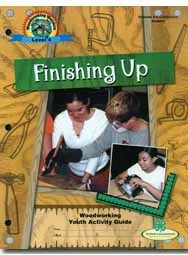 Specific woodworking skills include using a router, portable planer and jointer; making a blind mortise and tenon joint; making dovetail joints; and experimenting with adhesives and various chemical wood strippers. Youth can build a wooden toy car, a table top hockey game, a step stool, a toy dog, or a door knocker. Life skills related to the skills practiced and learned while doing the activities are planning and organizing, communication, decision making, problem solving, and learning to learn. Grades 9-12.